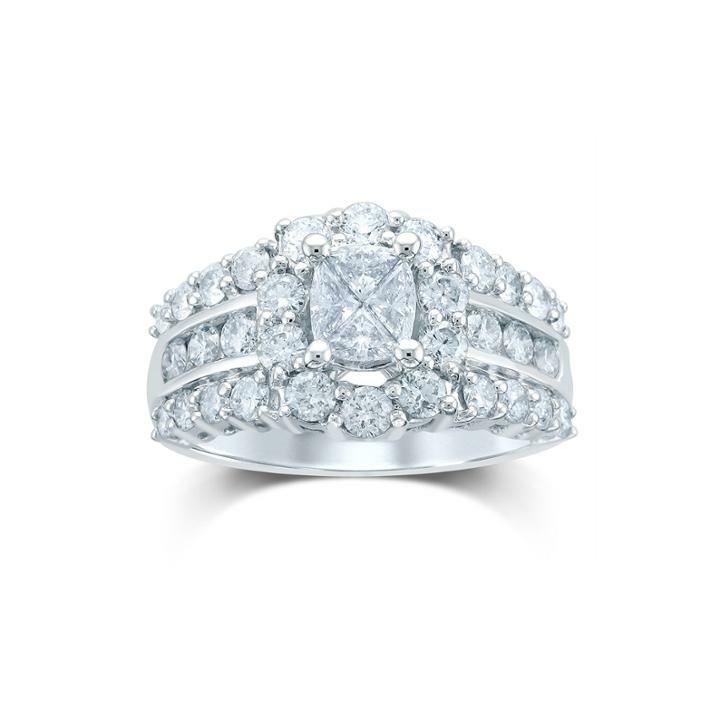 A quartet of diamonds is uniquely cut to give this white gold ring a center that's unexpected. Abundant round diamonds are prong set all around the rest of the ring so it can obtain maximum light for ultimate flash. Metal: 14K white gold Stones: 2 ct. t.w. fancy-cut and round diamonds Color: H-I Clarity: SI2-I1 Setting: Invisible and prong Dimensions: 10.7x12.3mm Gallery Height: 7.5 Diamond total weights may vary between .01 and .08 carat. Jewelry photos are enlarged to show detail. Diamond Geometric Ring In 14k White Gold, .70 Ct. T.w.